A solo exhibition of works by artist Charles Avery at Ingleby Gallery. Since 2005 Charles Avery’s practise has focused on a fictional Island; an all-encompassing, immersive investigation of the fabric and possibilities of another place. 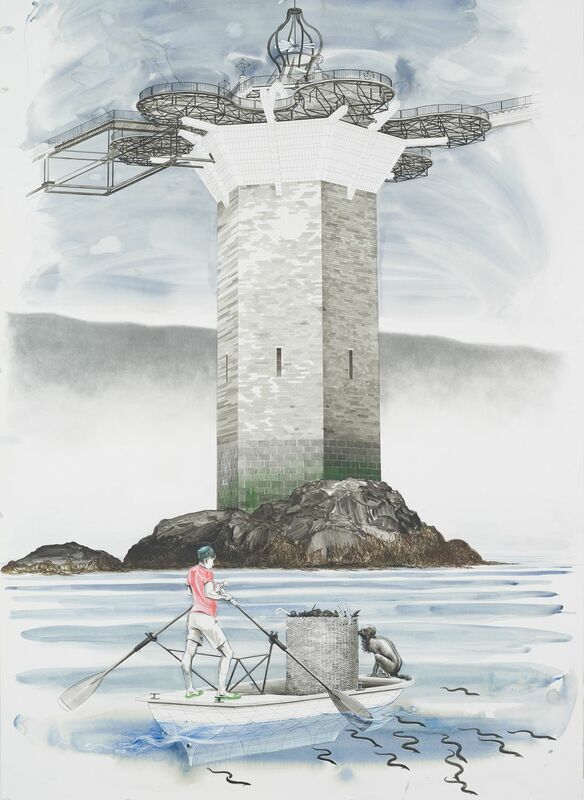 Through drawings, texts and objects Avery describes the inhabitants, architecture, philosophies, customs and idiosyncrasies of this imagined territory. With accents of the Scottish Hebrides and East London, the Island is situated at the centre of an archipelago of innumerable constituents. Its capital is the port city of Onomatopoeia: originally a stepping off point for pioneers and travellers, turned bustling boomtown, turned citadel, turned depression ravaged slum, turned regenerated city of culture. It has many eras, all encompassed by a monumental city wall separating it from the dark and violent wilderness beyond. Charles Avery’s exhibition; The Gates of Onomatopoeia, includes several new drawings and a large sculpture. 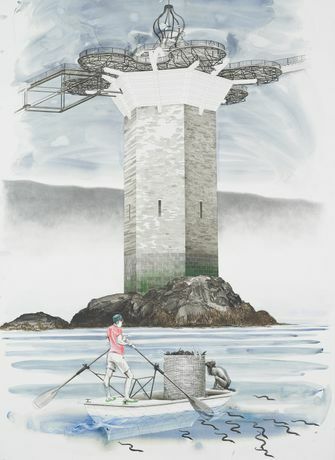 One huge drawing depicts two great towers that rise from the ocean and are connected by a bridge, marking the entrance to the city and the Island, and which form the centrepiece of the fortification’s seaward aspect. In the picture the surface of the water is calm, belying a foreboding, luminous pink sky. A passenger liner and a gin palace doze in the harbour. A few small fishing junks bob on their moorings. Humanity is discrete. Courting couples make out in the shadows, a man sweeps the quayside. It is not clear whether we are nearing day break or night has recently fallen. Other drawings in the exhibition show a street market taking place under the porticos, a lonely oarsman bringing wood by boat to fuel the beacons that guide the ships into port, the beautiful jejune radicals that argue and score at The Union Café, and the beasts that devour the scraps from the market. Tree #6 (The Union Tree) is sited in the centre of the gallery, towering over the space in an exuberant rebuke of nature (the Islanders regard nature with extreme wariness). Six meters in height, made of steel, blown glass, 24-volt electrics and an old shoe, it is part tree, part street-lamp and part temple. It is the latest exploit in a continuing project to imagine an inorganic flora, in Onomatopoeia’s city park, The Jadindagadendar. To the inhabitants of the Island, the Jadindagadendar is a refutation of nature, an embodiment of their rational intellect, a place for theatre, dialogue, romantic assignations or quiet contemplation — a pure expression of human will. To the critic Tom Morton the Jadindagadendar ‘continues the tradition of the garden as a philosophical testing ground’. The Union Tree is an expression of Euclidean space, its branches extending resolutely in accordance with the xyz axes, supporting luminous pendant glass forms that represent competing models of the universe. It forms the centrepiece of the Union Café (which also makes an appearance in the show) — a fashionable open-air bar of a radical, idealist hue attached to a down-at-heel stretch of the wall — under which young Onomatopoeian’s convene, commune, share ideas and get high.